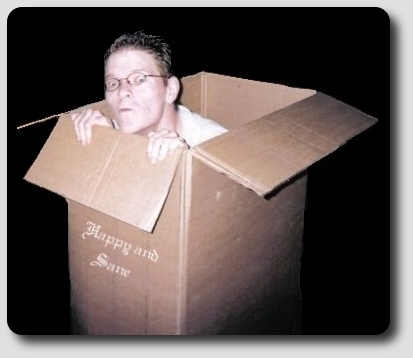 Happy And Sane .com, where hilarity ensues! Songs, Odd Quotes, Use My Junk?! Anyway, read on for the true enlightenment and spiritual revelation (you'll have an epiphany with each word you read!) that is abundant in each and every one of my funny short plays, stories, videos, and songs. Note: I'm probably not going to edit out all of the typos and grammatical errors of my older writings, because 1: I'm lazy, and 2: I plan on uploading new writings soon and I want them to look that much better by comparison. Oh, and yes I am aware that the infamous e-celebrity and author Tucker Max has recently stolen the title of this website ("Hilarity Ensues") for the use of his latest novel of the same name. Rather than suing him as my many nonexistent sponsors and patrons have pushed for, I have decided to let it slide beings as his are works of non-fiction and will be in completely different corners of the internet than my works of fiction. Thus, you'll encounter whichever "Hilarity Ensues" best suits your interests! Or why not both? "An Axemaster, a Midget, and a Pony": This is a funny short story about a man named Axemaster The Fierce and his quest to save his beloved bunnies from peril. Along the way he meats an aged hippy, a midget in a barrel, and rabid ducks guarding a mysterious fortress. After a creative writing peer of mine read this, she suggested that I write stories for kids; what with the whimsical nature of it and all. I'd probably consider toning down my adult themes and writing a childrens' story if I were paid a great deal of money. "A Change of Luck": Here is a mostly funny, albeit absurdest, short story about a man who believes he is cursed and destined to fail at the game of love. Will he overcome all odds and the fates themselves and find love, or will his hopes and dreams be smooshed? "The Fate of the Ancient Lizards" : Ever wanted to read the real story about how dinosaurs became extinct? Well, this is it... Scientists weren't too far off. Read it; you can't go wrong with funny dinosaur stories! A children's story if I ever read one (and I haven't). "Old Man Wars" : How oh how will the world's population count be controlled in the distant future when there are too many people!? This is a "funny" story about old men fighting in death matches... Your children will love it. It has recently come to my attention that famed author Suzanne Collins has used my "Old Man Warz" idea in her highly successful novel The Hunger Games, simply replacing the "elderly fight to the death" idea with "children fight to the death." I was told I should seek royalties, but frankly I'm flattered that she would use my idea for her amazing books (okay, I just read the 1st so far) and will do no such thing! That being said, I'm counting on some famous film director to adapt my short story into a film as well so that I too can make millions! "Happy Fun Times With Glee" :Ok, so this is a really really old story I started like... six or seven years ago and just decided to randomly finish. I stopped writing it back then because my sister pointed out how it starts out a feasible story, but spirals into an unbelievable one not based in reality. I agreed back then (and gave up on it), but rather than cutting the story where it starts getting dumb (i.e. shortly after the parking lot fight) and losing all of that precious dialogue, I decided just to tack on a quick ending for fun with the intention of maybe writing a stand alone sequel later. Old Junk Page 1, Page 2, Page 3. 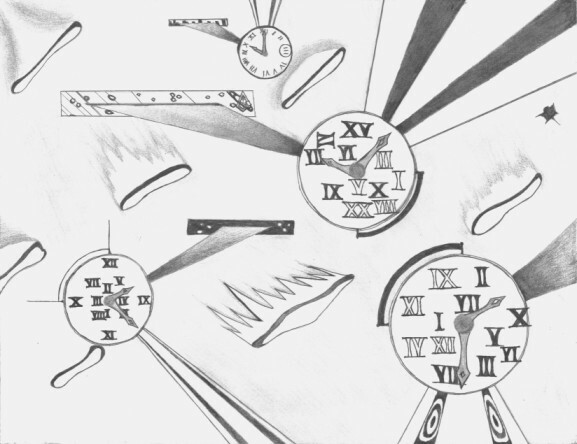 "The Fast Food Guy" : A funny poem about one special fast food employee and his quest to amuse himself. "Don't..." : A funny poem about running naked... and why you probably shouldn't in some situations. "Icky Intersection" : Another funny poem about the responsibilities of daycare workers and their inability to successfully guide children safely across intersections. Really old junk: Poems 1, Poems 2, Poems 3, Poems 4. So I am currently accepting/anticipating filmed versions of my plays/sketches! If you liked my plays and want to film yourself acting them out, I will gladly feature them on this website. It's Nuts : A short funny play (for two to three people) about squirrels fighting over which nut is better: acorns or walnuts. It's Just A Napkin : An insane, and hopefully funny, play (for three people) about life and love in a world that is just... strange. Visiting Gran Gran: Ok, so I recently decided to delve once more into the lives of quaint, but insane, individuals in this whimsical (and offensive) play about a father and sons' heartwarming visit to their dear old Gran Gran in the rest home. This 10 minute play is for three people. The Pet Rock Salesman: This is a whimsical five minute sketch/play thing where a charismatic door to door salesman tries to sell pet rocks to a lonely housewife. Oh look! "The Pet Rock Salesman" finally got filmed as a youtube video! True, I am much better at the writing style of playacting, and I can't be bothered to memorize two and a half minutes of my own written dialogue, but it was still fun to make! Think you can do better? Feel free to film yourself acting it out and submit it to me under the "use my junk" section of this website and I'll feature it alongside my attempt. Fame and fortune will immediately follow for you! Oh, and you'll probably notice that most of these videos can be remixed by anyone, so if you're ever bored (and if you found this site, chances are you are), feel free to remix them with the youtube video editor! "Sophisticated Apes: Episode I" Are flaming machetes, slippery probes, and child trafficking jokes right up your "alley?!" Then we have the video for you! It's better to watch on youtube as you can (hopefully pretty soon) watch it in HD. "The Mime:" A Halloween video of a "scary mime" (Nick) chasing a happy-go-lucky tree hugger (me). Really a pretty creepy video. "The Mime," Remix! Since the original was published under a free license, I went ahead and republished my own retelling of this creepy video! "Sandwich: A Tale of Emotions and Stuff:" This video tells the tale of an extremely depressed young man who tries to find happiness by transforming himself into an alien. "Between States:"A deeply inspirational tale about one man's struggle to find the meaning behind his dreams and the friends he grows to love and cherish along the way. And here are some random videos of me blowing up a DVD player! "Destroyed, smashed, DVD player "accident" explosion (My DVD collection) "Here you see the horrific explosion (by fire) and destruction of a DVD player that wouldn't run one of my favorite DVDs. Having been inspired by a friend's DVD collection youtube video, I decided to make my own. I have a short fuse though, and when things didn't go my way, the robot (DVD player) had to pay. "Fireworks + Gasoline + DVD Player + Christmas tree = horrific explosion of fire! "Here is an excised version of the first video, with just the fireworks explosion. I'll upload more of these eventually (I want to rerecord most of what I've written), but in the meantime "enjoy" a version of "The Moose Song" in which the tracks are out of sync. "The Moose Song" lyrics. Ok one more. Here is "Don't Run Naked" Here are the:lyrics. The "Best RPGs of All Time list: It's exactly what it sounds like a list of the best RPGs of all time... that I have played. Ok, Ok, so this one hasn't "caught on" yet, but I feel like it will... Here is the list of Top 50 NES Games Ever Made! As well as The Top 10 Wiiware Games Ever! Here is the video game villain selectsmart quiz I made many many years ago "Which RPG Villain Are You?" Here is a slightly newer, and slightly better test. It was originally an OkCupid test, but now you can find it at helloquizzy. In it you listen to video game midi files and guess the game name to see how much you know (it has a slight Nintendo bias): The "Great Video Game Music Test!" In the esteemed 4v4 RT gametype, an ally of mine decided to "play farmer" and mass critters within a farm barricade. Here we see Blizzard and Flamestrike destroy an entire game's worth of farming in 3 seconds. Here is a Pitlord and a massed Ancient of Wonder rush for your consideration.P P P Pitlord!! The extremely dated "Top 100 Video Games of all Time list. Here is a lame webpage I used to keep updated with Chrono Trigger 3 (Chrono Break) rumors. Use My Junk? : So I occasionally get requests from high school students wishing to use my plays or stories for forensics debates and such, and I'll usually allow it if you email me about it first. Also, if I do let you use my works for this purpose, e-mail me again afterward to let me know how your team did! 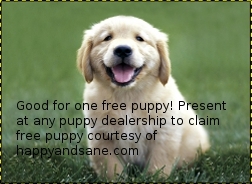 The world is a great place now that free puppies and free tacos are abundantly available at happyandsane.com! 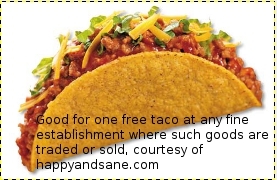 Simply print out your free taco coupon and/or free puppy coupon and present to any vendor of such to claim your reward! Feel free to print as many coupons as you like!!! Bambi's Mom Didn't Really Die! Now, I really think Bambi's mom set up/faked her own death! "Why would she do a thing like this?!" you ask, well film historians have been going through the movie for years, and they believe they have found an obvious motive. You see, Bambi was a little pansy (as seen in his choice of friends), and would have never ever made a good "Prince of the Forest." And so, his mom faked her own death in order to traumatize Bambi, making him angry and therefore a much stronger deer.